LEE Joo-hyung’s Red Family was the audience favorite during the recently wrapped Tokyo International Film Festival (TIFF), which ran from October 17th to 25th. The family spy drama picked up the Audience Award from this year’s 26th edition of TIFF. The film, about four North Korean spies who pose as a family in the south, is the debut of director LEE but was also penned and produced by renowned auteur KIM Ki-duk. One other Korean film that played at TIFF this year in the Asia Future section. Korean Academy of Arts (KAFA) features Tinker Ticker, from director KIM Jung-hoon had its world premiere during the festival. Actress MOON So-ri (Oasis, 2002) was also on the jury this year. Just last year, KANG Yi-kwan’s Juvenile Offender picked up two awards, Special Jury Prize and Best Actor in a Leading Role (for SEO Joung-joo) at the Tokyo Film Fest. 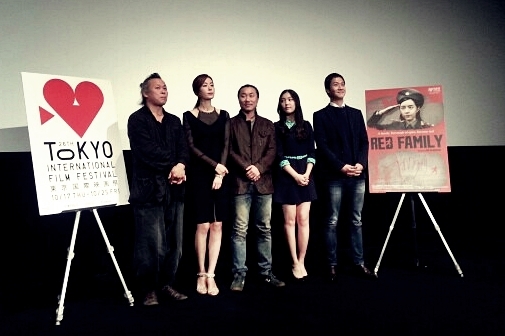 Red Family had its world premiere as part of Tokyo’s main competition. The film will be released in Korea on November 6th.